Performance and Innovation; multi award winning Chaparral have been building saltwater tough sports boats since 1965 and are now number one in the tough U.S. market, as well as in the U.K, Spain and Australia. With an exciting range of boats from 18 to 33 feet, Chaparral offer inboard, outboard and jet powered sports boats and diesel cruisers that set the standard in every way. The world’s best sports boats, bar none! The Vortex crafts a sleek, classy profile with dry-riding freeboard and Chaparral quality to bring jet boat design to a whole new level of innovation. The standard wide band gelcoat is accented with a sport graphic and is available in Biscayne Blue, Black and Fire Red. A color-matched interior is highlighted with detailed embroidered logos. Under the hideaway engine hatch cover, a supercharged Rotax power plant and jet propulsion drivetrain deliver exciting low-end pulling power, efficient cruise and plenty of excitement on top-end. A folding arch tower is optional with board racks also available as an added extra. The H2O is an exceptional value. Extended V-Plane performance delivers wakeboard pulling power and efficient midrange. A full windshield with alminum frame and clear view curved glass, a molded cockpit drainage system, circuit breakers on the dash and stainless steel cleats are designed to weather the tough marine environment. Stainless steel hardware, non-skid flooring, and battery on-off switch go one-up on rivals. Storage is abundant...under the seats, in the helm, in a wakeboard sized floor locker and there's also a cooler under the back seat. Key options include snap-in cockpit carpet, a swim platform mat and a Velocity Folding Arch Tower. If you prefer to stay in the 20-foot range but insist on premier quality and style, there isn’t a boat that compares to the SSi. We didn’t take any shortcuts inside or out. This boat features the best Chaparral has to offer including heavy-duty stainless steel hardware, plush upholstery, a new vinyl wrapped helm and Kevlar® construction. Want to add some value-minded extras?Check out our new Preferred, Deluxe or Elite option packages. 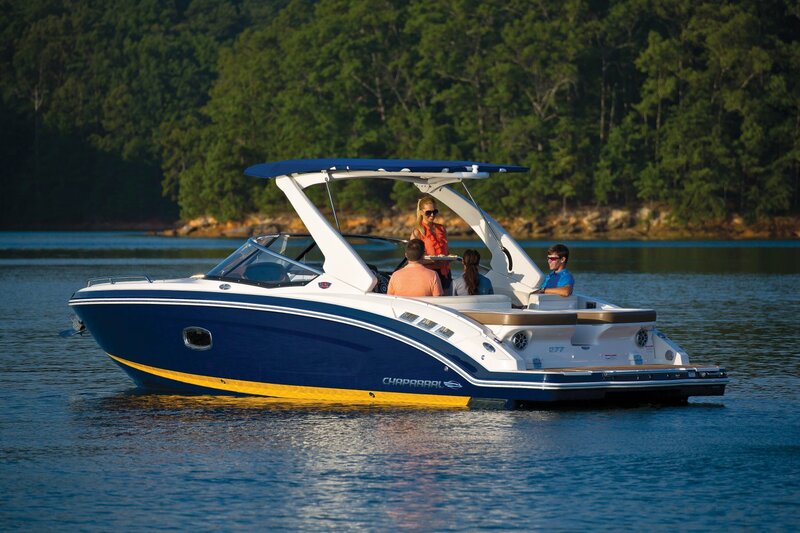 Options like a wakeboard tower, Garmin GPS, bowrider ﬁller cushion and snap-in carpet add a custom touch. Step onboard the sensational SSX and experience the perfect mix of classic elegance and high tech innovation. Bow to stern, the eye appeal is simply stunning as you enjoy the pleasures of handcrafted workmanship. A transitional lounge opens up all kinds of entertainment opportunities. Showcasing innovative dual lounges, the aft seats effortlessly "switch" from a performance-minded sport boat to the ultimate in sun worship. Endless storage puts an end to onboard clutter. Aft, the center walk thru design is an open invitation for family fun. Incorporating Chaparral’s patented Wide Tech™ technology, the action-packed Sunesta mixes the roominess of a deck boat with the zest of a sport boat. Nothing sizes up to the Sunesta when it comes to performance and features. Uncover huge storage areas under the seats, in the starboard console and in a wakeboard-sized ﬂoor locker. The cockpit wet bar is ideal for light snacks. Three easy-to-reach ice chests are super cool. Want to beat the heat? An oversized, color coordinated Bimini top keeps you covered in typical Sunesta style. Our Signature ﬂagship sets the “standard” by which cruisers are measured. Literally. Here’s the deal. Some rivals create a misleading sticker price by cutting corners on the standard equipment list. We wouldn’t dare. The look is bold, innovative and distinctly Chaparral. The Signature is available with two cabin interior options. Helm seating includes a captain's bucket and a dual companion seat. The standard ﬁberglass hard top is perfect for all-season boating. Well equipped standard, you can customize from an options list that includes underwater lights, a foredeck sun pad, a cockpit gas grill and a sound system upgrade. The SunCoast range leaves nothing to desire. Forward is an anchor locker with a hinged telescopic boarding ladder for retrieving the crew after a beachside party. Wrap around upholstery allows for either multiple seating, or dual loungers. Drink holders, Speakers, and plenty of storage are things Chaparral just doesn't compromise on. Oversized stainless steel grab rails mounted on both port and starboard side are standard. . From the seating to the helm, to the outboard power plant, we've packed it with a lot of great things. 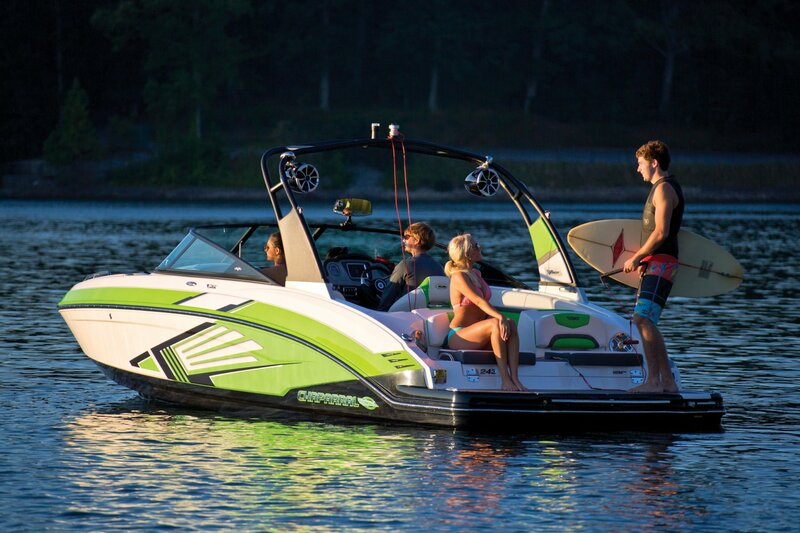 The Surf range combines Chaparral style of the SSX series is known for, with the fun sport of wakesurfing. A specially designed hull, Volvo Penta Forward Drive, Malibu Surf Gate™, and Medallion touch screen control marry together to complete the perfect wake. There's room for everything and everyone. The speed, fuel efficiency and maneuverability of a stern drive, and a wake that even a professional ride can appreciate. Surf in the morning, hang out at the sandbar in the afternoon, and cruise to your favorite waterfront eatery in the event. All with the same boat. When you’re shopping for a new boat, performance, price, quality and style certainly impact your decision. Equally important is the name on the hull side. Respected as a marine industry leader, Chaparral is a name you can trust. Always has been. In the last half century boat building has changed dramatically. Computerized routers, space age materials and amazing electronics make today’s pleasure boats a technological marvel. However, while much has changed, much is still the same. Whether it was built in 1965 or 2014, every Chaparral is truly a labor of love. Most of the process is still done by hand by expert craftsmen that take personal pride in every boat they build. People make the difference. 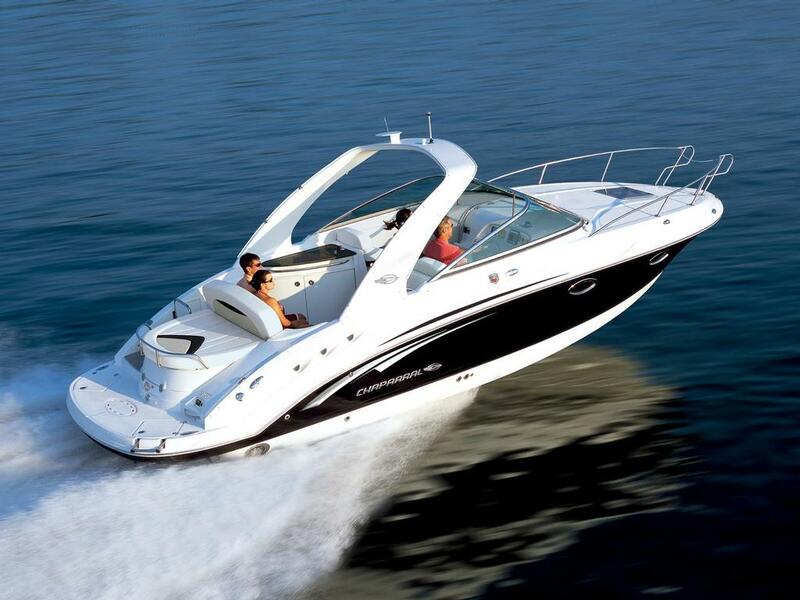 Chaparral has the best and most experienced boat builders in the industry. It all starts at the top. President Jim Lane and Founder Buck Pegg have steered a steady ship from day one. No other management duo in the marine industry has more experience. Both are hands on every step of the way. A culture that focuses on innovation, quality manufacturing and excellence in customer service is led by an experienced and forward thinking senior management team. While management leads the way, the real heartbeat of Chaparral is a team of employees that have taken boat building to new levels of excellence. Many have fine-tuned their craft for more than 10, 20 or even 30 years. Boat building is in their blood. Chaparral has nearly 1,200,000 square feet under roof spanning more than 150 acres. Centering our entire operation in Nashville, Georgia allows us to maintain the highest Quality Control standards. So how does Chaparral rate? At the top. Chaparral has won an unmatched 45 awards for product excellence, 12 Boat of the Year Awards, the NMMA Innovation Award and several JD Power & Associates awards. We complement our award winning boats with customer service to match. Chaparral has earned the NMMA CSI Award for Excellence In Customer Satisfaction six years in a row. We invite you to get onboard...Chaparral is truly Leading By Design. We have handpicked five boats from our existing model line up to optimise for wake surfing. We have redesigned the running surfaces to develop a bigger, cleaner wave with Malibu’s Surf Gate system. The key difference with the new surf-boat range is that its traditionally efficient hulls still come into play once the boat goes beyond surf speed. The new hulls will pull themselves deeper into the water in the surf zone, but then emerge into efficient performers at water skiing and cruising speeds. The new surf boats incorporate Volvo Penta's fuel-efficient Forward Drive, which offers great handling and easy adjustment of the wave length and height via normal trim. Our Forward Drive can operate in shallower water than traditional shaftdrive tow boats, and are all designed for saltwater with lasting construction and materials. We also offer our patented Aerial Surf Platform that creates a surfable wave behind its Vortex jet-powered boats. Other features of its new surf boats are ballast, lower swim platforms, and the Viper 2 surf computer from Medallion which, with the optional Bluetooth wrist band, allows the surfer to change the wave from traditional to goofy, alter the boat speed, and pump up the tunes while surfing out the back. From the new dual angle U-Slide lounge offered on our Sunestas and Xtremes, to the multi-position sun/chaise lounge on our SSi offerings, to the adjustable aft seats on all of our SSX Series offerings, Chaparral’s interiors are designed to open all kinds of possibilities. 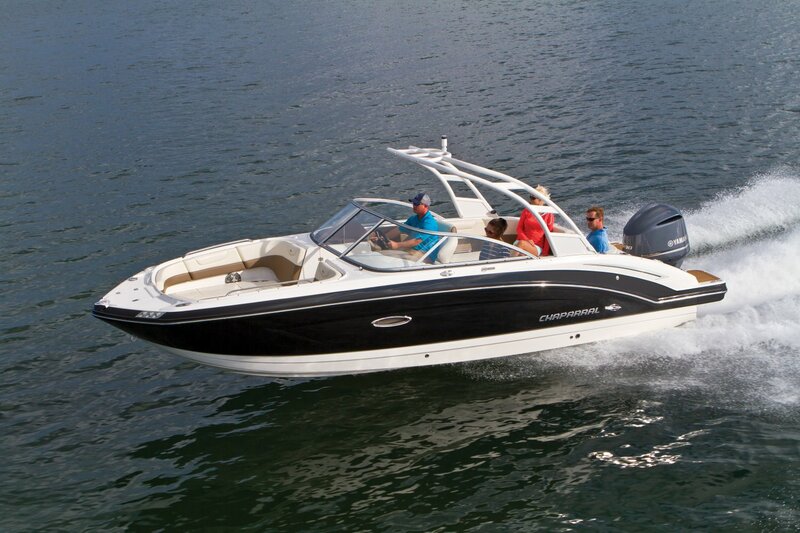 All of our sport boats feature an integrated swim platform. View the seamless styling. Mounted close to the water, our platforms make it easy to move in and out of the water. A three step telescopic boarding ladder with a top rung grab handle mounts in its own compartment. An innovative difference that distinguishes Chaparral from most rivals is our boats are reinforced with Dupont Kevlar® for a strong, secure and quiet ride. Considered among the strongest composites available, Kevlar is used in the construction of bulletproof vests and delivers a better strength-to-weight ratio than any other laminate. Chaparral takes an innovative approach to seat design. Depending on the model, our form fitting bucket seats offer either an under seat mechanism or handy lever controls in the armrests. A flip-up front cushion allows stand-up or sit down operation. In the up position, the cushion fits close enough to form an elevated bolster. Additionally all of our seat and sun pad cushions are constructed with 35-ounce expanded vinyl. High density foam with mildew inhibitors is soft enough for a comfortable ride, yet sturdy enough to maintain its shape. Flow foam is positioned between the structural foam and the seat base to create additional space for moisture to escape. Aluminum supports add strength and Starlite seat bases repel water better than wood. Extended V-Plane is a no-nonsense approach to bottom design. Unlike rivals that come up as much as two feet short in the critical area where the fiberglass meets the water, our award-winning Extended V-Plane running surface stretches full length. In demanding and shifting water conditions, a longer and wider running surface means smoother, more controlled per-formance. Extended V-Plane puts the all-important area beyond the stern drive cavity to work so every inch of fiberglass you paid for is delivering the best ride possible. The added length acts like trim tabs, allowing our boats to stay on plane at slower speeds with improved fuel economy while towing wake boarders. Additionally, you won’t find a quicker planing V-bottom. Chaparral’s quest for innovative excellence extends to areas you can't see. We rely exclusively on stainless steel hardware.The difference is our cleats are reinforced with supportive backing plates for an added measure of durability. Additionally, our boats are designed with a molded drainage system to direct water away from the storage lockers to help items inside stay dry. Now that's attention to detail. © 2008-2016 Chaparral Boats, Inc. All Rights Reserved.